To activate a node-locked license, use the LicenseActivator.exe software. That software is bundled with The Report Viewer. LicenseActivator.exe is installed next to the The Report Viewer executable. 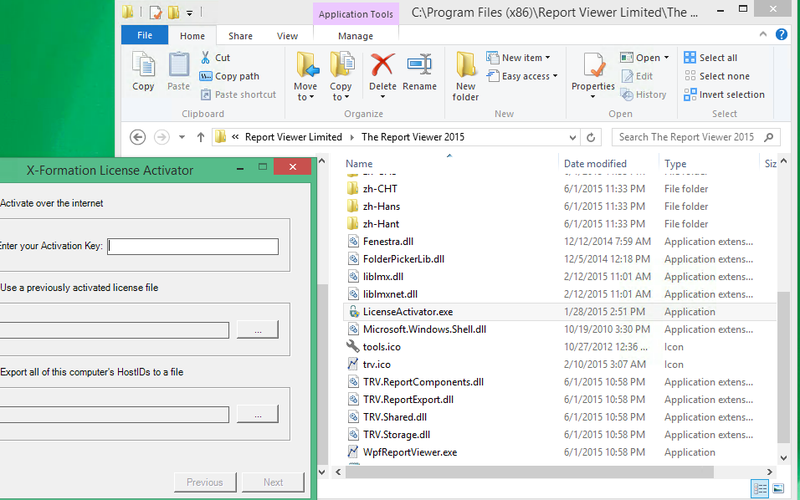 Look at C:\Program Files (x86)\Report Viewer Limited\The Report Viewer\LicenseActivator.exe or a similar location. That software will allow you to activate The Report Viewer. Please contact us if you have any issue activating your license. Node-locked licenses are attached to the specific computer. You can use the LicenseActivator.exe to reactivate your node-locked licenses on the same PC. Reactivation on the same PC does not count against your total number of activations. License hosting is provided by X-Formation. You may recover your already activated licenses from the License Activation Center. While you may activate your license from the License Activation Center, we ask that you do not do that unless you know what you are doing. Manually activating the license this way is prone to human error and risk locking you out of the software.